Modern versions of Windows have General MIDI capability in the form of the Microsoft GS Wavetable Synth. This is the default General MIDI device that emulators such as DOSBox or ScummVM will use. While it works well, the sound quality is quite average and can easily be improved by installing a different MIDI device and loading what are called soundfonts. 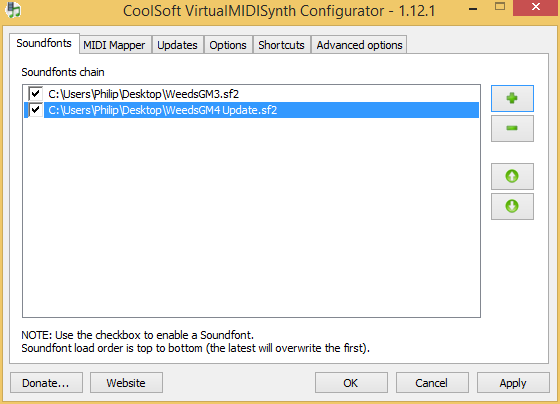 The MIDI device I use is the CoolSoft VirtualMIDISynth, which can be downloaded from here. Another pupular MIDI device is BASSMIDI, which can be downloaded from here. Timbres Of Heaven GM_GS_XG_SFX V 3.0 Final !!! There is no "best" soundfont as it is very subjective and different games might sound better on different soundfonts. One thing is certain however, they all sound much nicer than the Microsoft GS Wavetable Synth! This is a great soundfont created by Rich ¥Weeds¥ Nagel, who was kind enough to let me host it on this website. He has his own website with an amazing collection of MIDI related topics. I was kindly granted permission to hist this soundfont on my website.